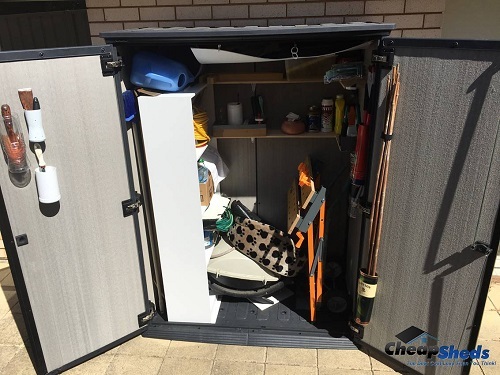 Some people are looking for easy storage solutions which are attractive but not necessary permanent. Especially if you move a lot or rent! 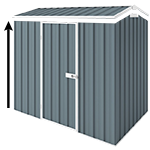 Plastic Storage Sheds are VERY popular in Australia because they are super durable, high quality and lightweight. 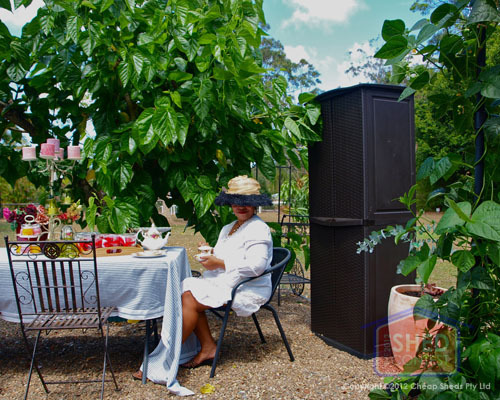 They come in all sizes from deck boxes and cabinets to full garden sheds. 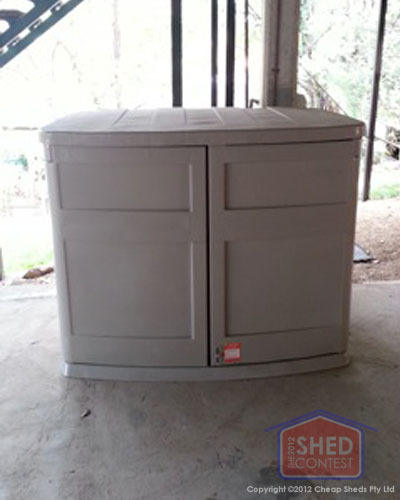 Below you will find stories and reviews sent in from our Cheap Sheds customers who love their Plastic storage solutions. We can tell you that we provide the best service online and great products... but who better to tell you the facts than our own customers. Thanks for the ebooks, I will try to put them to good use however living in the upper Blue Mountains on a small shaded block, its very hard to grow veggies. 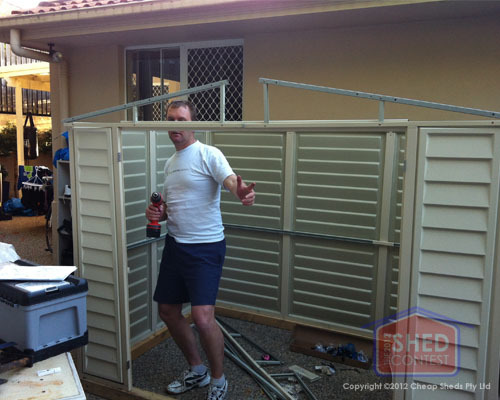 The shed went together well without any hitches. 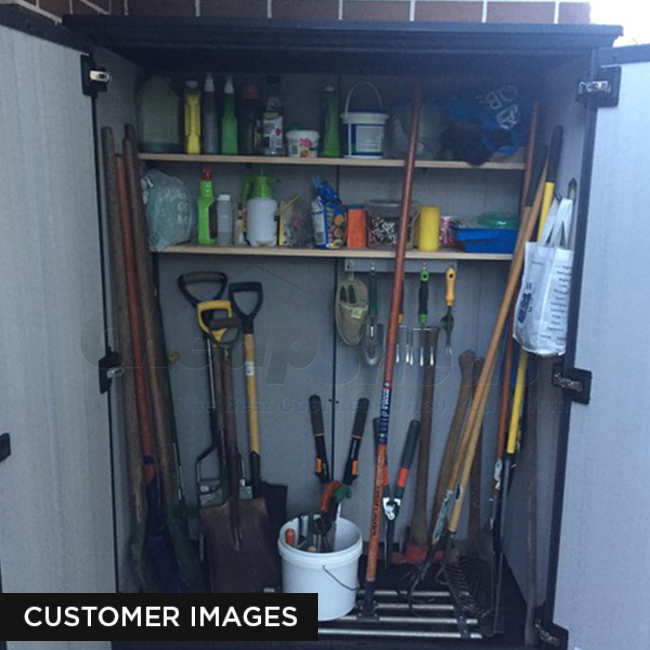 I’ve been able to fit in all our gardening tools as well garden chemicals on two shelves as can be seen by the attached images. 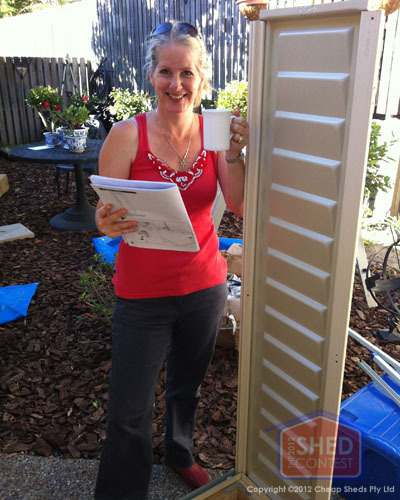 We were very pleased with the service you provided during the purchase of the shed. 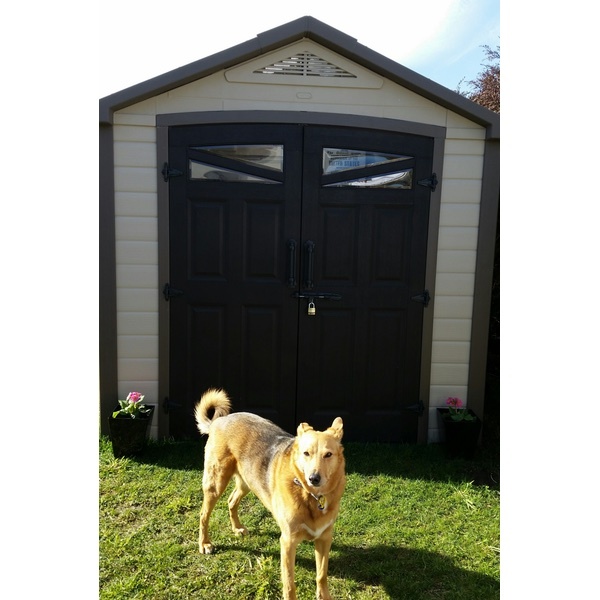 Your web page and online purchase section was very easy to navigate and to our surprise the shed arrived much earlier than we anticipated. Thanks again for following up. It’s refreshing to know that a company still believes in after sales service, sadly its not a common phenomenon. We will however, NOT SHARE A SHED and that is precisely why we bought TWO IDENTICAL SHEDS from Cheap Sheds earlier this year. With well-set out instructions and precise parts we managed to build the sheds without a divorce. 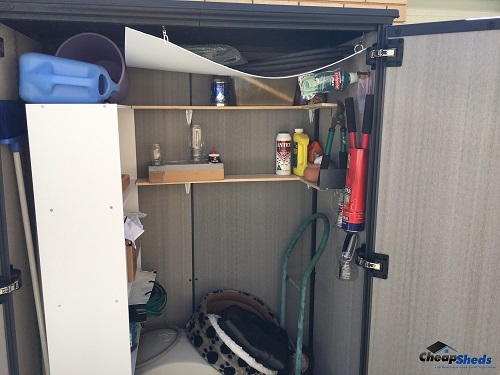 „His‟ shed has become his „man cave‟ with all his tools and sports equipment neatly organized within. 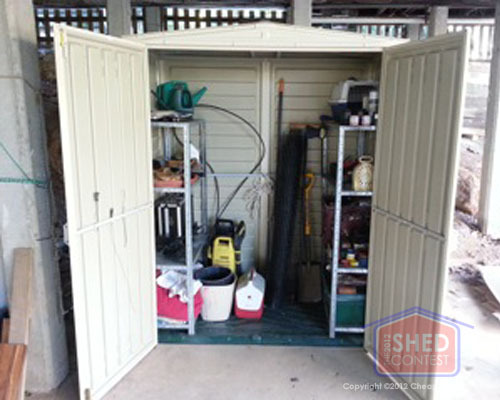 My shed has become my „gardening haven‟ where I can keep all my gardening equipment and materials in perfect order. In total harmony we work side by side, both enjoying the additional space our vinyl sheds are providing. 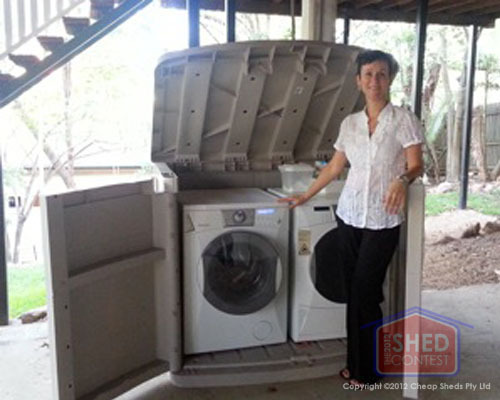 After 20 years of marriage, my husband and I have learnt that some things in life are worth sharing and some things are not… the sharing of a shed is not one of them, but the SHARING OF A LOVELY HOLIDAY in BALI certainly would be! 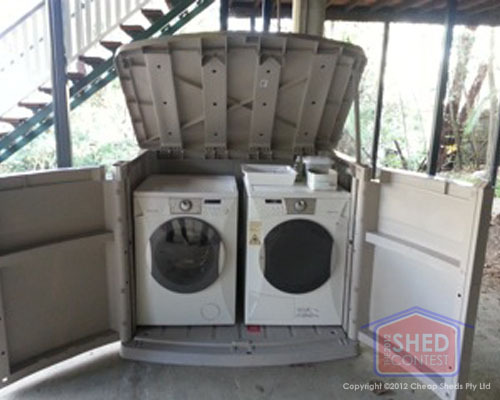 We live in an old Queenslander and needed a laundry for our front loader and dryer. They were sitting on the concrete slab under the house and looked sad as well as ugly. Bingo the Suncast shed gave us a very cheap and neat solution. It's like now you see it -- now you don't. The grey water also comes in useful for watering our garden. 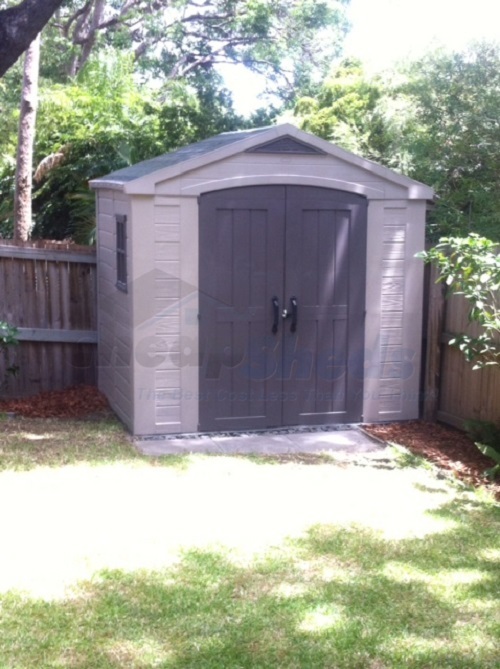 On the other side of the slab I put a Yardmate vinyl shed. All together awesome. 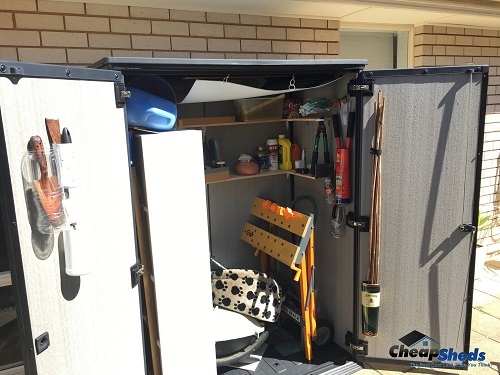 Thanks to cheap sheds. Our previous home had a 2.5 bay farm shed however our current home has a large loft shed but it is always full of my husband's stuff (not my things!). Finally a few months ago, I decided that I deserved a shed to call my own. 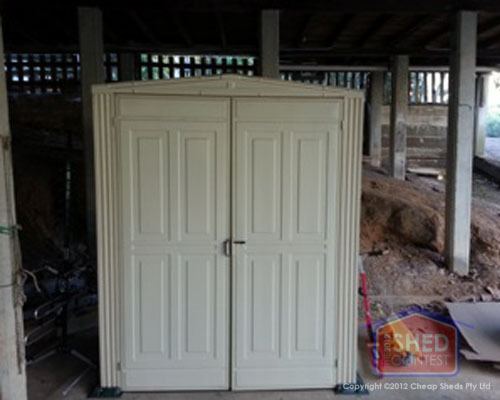 After some sleepless nights and driving here and there, I found the Cheap Shed dot com. First I thought, “No, they probably just sell some boring square sheds with no personality". 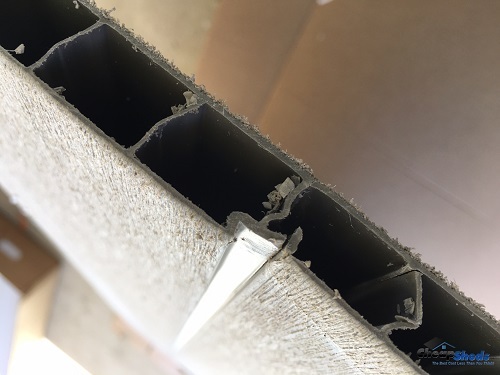 But after browsing their website, I was enchanted by the range of products in stock, a team of staff with expert knowledge and their easy ordering system. In fact it was quicker to get them to deliver the shed than it was to get my husband to unpack and assemble the shed itself. 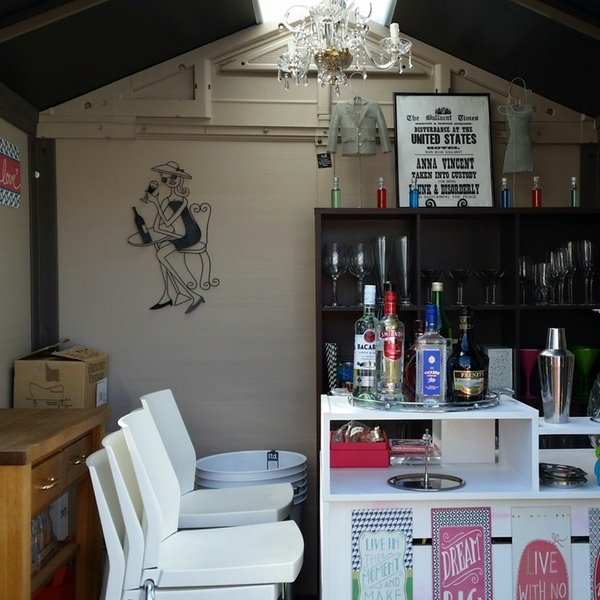 Now, not only I have got MY own shed, but also I have a shed that is as girly as me! I keep forgetting to say thank you for all your help. Michelle was fantastic, and all your emails, videos and notes are very good. 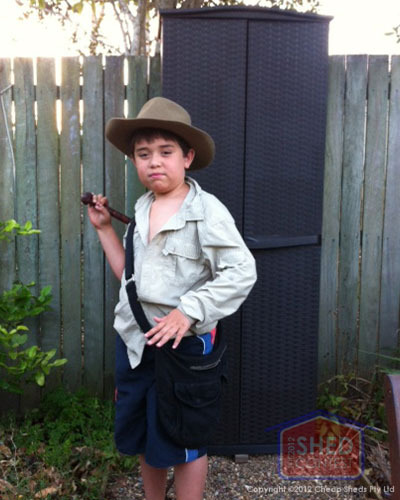 It was great fun putting the "Narnia Wardrobe" together. (For this size, there is no need for two people). It was a 46 degree day, so it took rather long, but it was easy and an enjoyable experience Of the final product too.Just what I needed. Just like the name suggests, it truly is the crown of all other options currently on the market. ...I have already let people know. At least one is looking at building a shed in a near future. 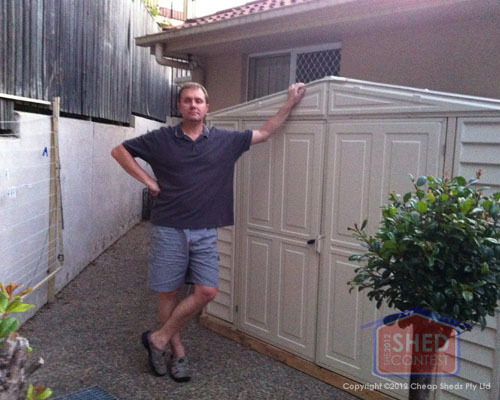 Hopefully he will choose your co.
Chuanna from NSW purchased a Store it out Max Resin Garden Shed from Cheap Sheds recently. Check out the video as he shows you the features and what he liked about our service. Thank you again Chuanna, appreciate the kind words. Are you serious ? Always think these sort of emails are bogus etc. The Webber Baby Q will come in handy as we have just purchased a caravan. next weekend. I'll take a photo and send it too you when done. 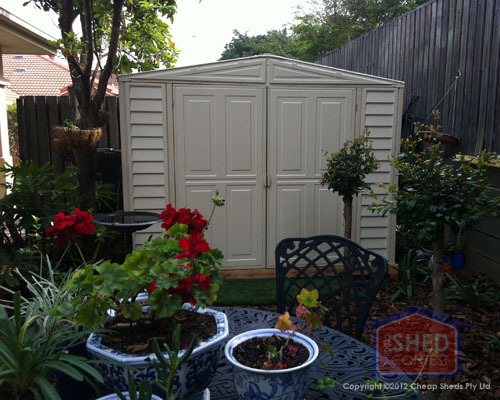 Tony has a Factor Keter Shed from Cheap Sheds. 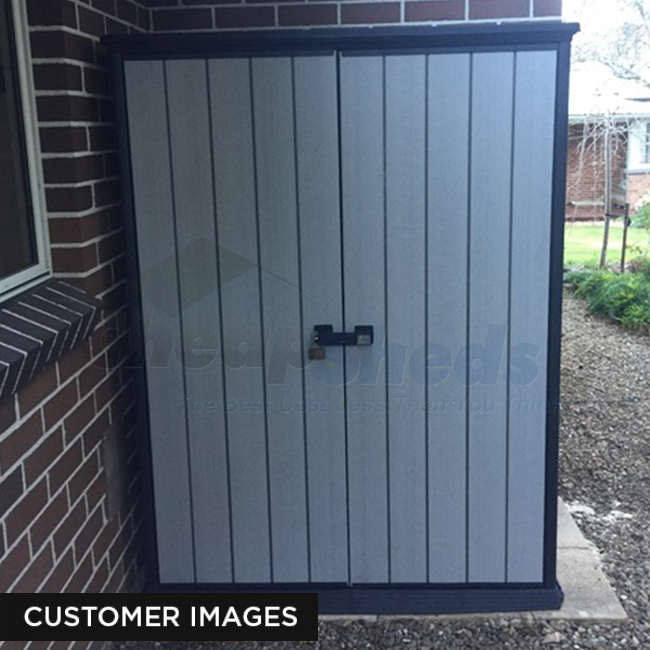 Attached are three photos of my new shed which is just perfect for what I wanted, compact, functional, easy to maintain and good looking. As you can see I have lined the shed with some steel mesh panels which makes it easy to hang all my garden tool up keeping the floor clear, a small section of shelving to hold my garden products and the job is done. The service you and your team provided was outstanding. 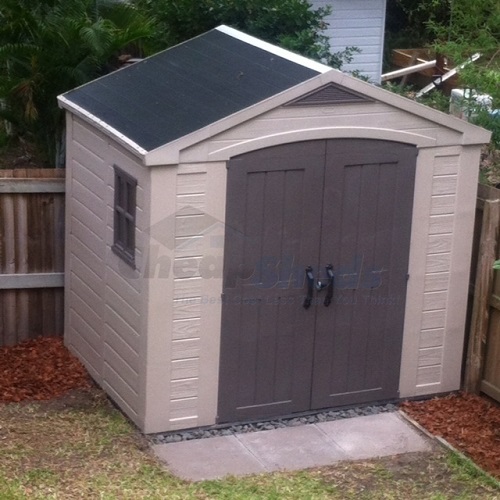 The delivery was prompt and the shed easy to assemble. 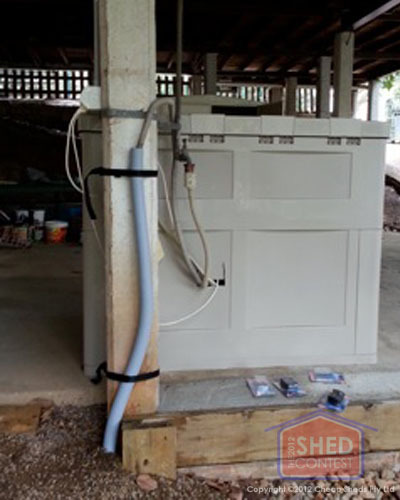 This is my fabulous she-shed that I used my Cheaper shed for. I love it!! !